It is worse, much worse, than you think. The slowness of climate change is a fairy tale, perhaps as pernicious as the one that says it isn't happening at all, and if your anxiety about it is dominated by fears of sea-level rise, you are barely scratching the surface of what terrors are possible, even within the lifetime of a teenager today. Over the past decades, the term "Anthropocene" has climbed into the popular imagination - a name given to the geologic era we live in now, one defined by human intervention in the life of the planet. But however sanguine you might be about the proposition that we have ravaged the natural world, which we surely have, it is another thing entirely to consider the possibility that we have only provoked it, engineering first in ignorance and then in denial a climate system that will now go to war with us for many centuries, perhaps until it destroys us. In the meantime, it will remake us, transforming every aspect of the way we live-the planet no longer nurturing a dream of abundance, but a living nightmare. The Uninhabitable Earth hits you like a comet, with an overflow of insanely lyrical prose about our pending armageddon. 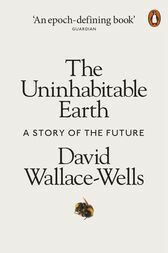 David Wallace-Wells is deputy editor of New York magazine, where he also writes frequently about climate change and the near future of science and technology. In July 2017 he published a cover story surveying the landscape of worst-case scenarios for global warming that became an immediate sensation, reaching millions of readers on its first day and, in less than a week, becoming the most-read story the magazine had ever published -and sparking an unprecedented debate, ongoing still today among scientists and journalists, about just how we should be thinking, and talking, about the planetary threat from climate change.